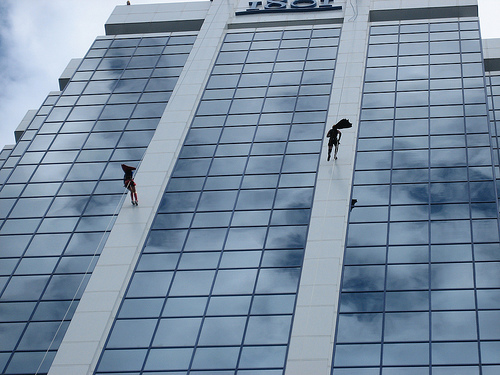 The Easter Seals Drop Zone is one of the most exciting fundraisers that takes place in Halifax. Every year you see those crazy people rappelling down 1801 Hollis and wonder – what is this for? Well, wonder no longer. Our awesome friend Jenn Holland is participating in the 2011 Easter Seals Drop Zone so we got the scoop first hand. First and foremost Easter Seals is an amazing charity that helps make life a little easier for children and youth with physical disabilities. Jenn is a huge advocate for children with disabilities to be active and have the resources to do so to the best of their ability. Easter Seals provides their services across Canada and she wanted to be able to contribute to their cause, even if it means rappelling off the insanely high building at 1801 Hollis St! Jenn is well on her way to achieving her fundraising goal of $1,500 but could use our support to ensure she meets her target. So check out Jenn’s fundraising page here and donate what you can! Then on September 24th – 25th be there to cheer Jenn on!